This is a continuation from a previous entry. An Argentine special forces section reinforced with a GPMG has spent the night at the Top Malo House and is getting ready to resume its march towards an extraction point when it is surprised by a British counterpart (a special forces section reinforced with a weapons team). Things do not start well for the Argentines (green icons): they received fire from the British (tan icons) right from the start of the scenario. The British appear to be posed for a flanking assault on their left flank supported by the weapons section. 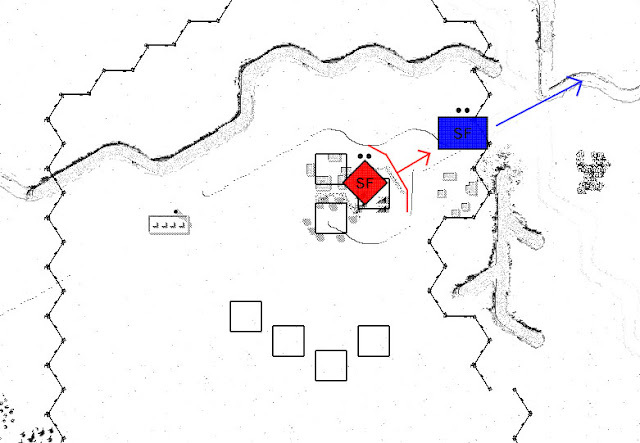 Note the precarious, exposed position of the Argentine GPMG (blue icon near the green counters). 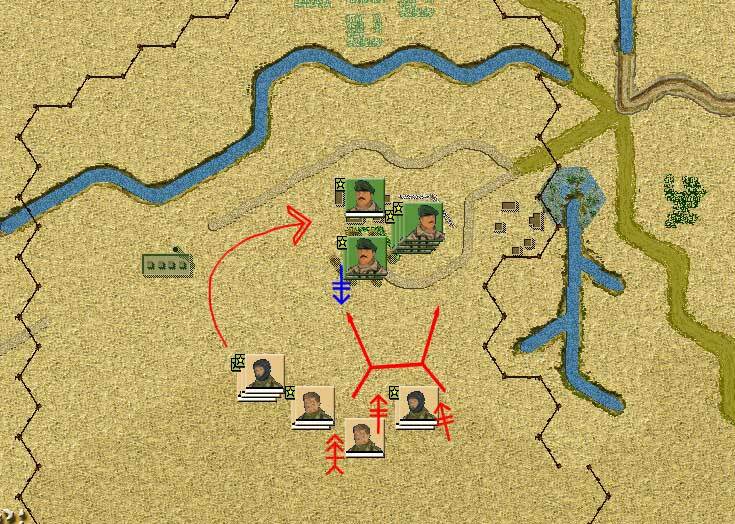 In this entry, the tactical choices for the Argentines. Given the apparent course of action, the personnel and weapons of the British, the Argentines are in a tough spot. In the real life battle, the Argentines knew that getting caught in a house with the weak structural features of the Top Malo House would be a disaster. In the game's scenario, the "house" is actually three hexes of village terrain that offers some moderate cover. 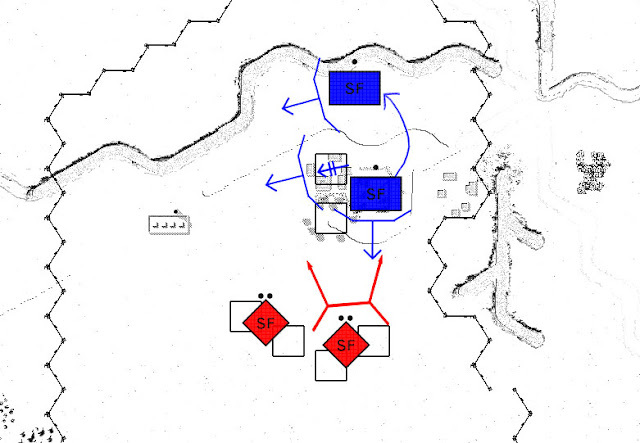 However, as you can guess from the map above, keeping all the Argentine troops in their start positions at the built up area will quickly result in an attrition-fest that favors the British (see my previous entry about the TO&E, the British have plenty of fire support). Course of action 1, an all-hands on deck "Alamo" type of resistance from within the house, unlikely to succeed. The instinctive reaction of the Argentines back in 31May1982 was to get the hell out of the house. In the game it is possible to pull all the Argentine forces from the house, but as seen below, this choice opens a can of tactical worms. The trails and roads near the Top Malo House offer a relatively quick withdrawal route for the Argentines (blue icons and symbols). However, any glitch during the withdrawal will catch the Argentines moving in the open with the British firing from the protection of the Top Malo House. Besides that, the Top Malo House itself is an objective in the scenario. Course of action 2, withdrawing using the trails and roads northeast of the house, should be translated as "withdrawing under unchecked heavy enemy fire". This course of action is discarded. Course of action 3, the least bad among three horrible choices is shown below. First off, move the GPMG out of enemy sight and place it in a position where it can't be shot from the enemy support weapons and where it can shoot the enemy assault forces coming at the right flank. Second, move one fire team out of the Malo House and place it where it can shoot at the enemy assault forces coming at the right flank. Third, leave a fire team at the Malo House checking any movement from the enemy support weapons. Coming up next, the after action report.